Services are scheduled for 2 p.m. Monday, July 23, at First Baptist Church for Jackie Allison Nance. The Lord sent a host of Angels to carry our precious mother to her heavenly home Thursday, July 19, 2018. Ty Houghtaling will officiate the services, with interment to follow at Woodbine Cemetery. Pallbearers will be grandsons Eddie Nowak, Tony Nowak, John Bean, Cortney Bean, Hazer Archer, Scott Maxwell and Sheldon Maxwell. Honorary pallbearers are all her great-grandsons. Visitation will be held from 2-6 p.m. Sunday at Terpening & Son Mortuary. The Lord knew Wilma Jacqueline “Nanny” McDonald was tired but anxious to be reunited with her daddy, James David McDonald, and mama, Ollie Candace (Brittian), to whom she was born Sept. 11, 1926, in Aspermont, Texas, the youngest of 12 children. When Jackie was 5 years old in 1931, she, along with her parents and siblings, moved from Texas to Hope in a covered wagon. 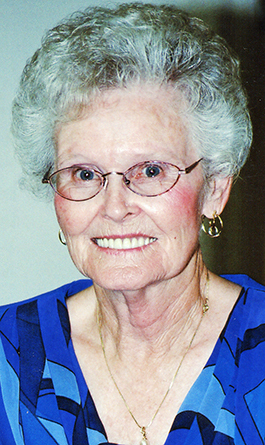 She began her education in a one-room schoolhouse in Hope, and later, the family moved to Carlsbad, where she graduated high school in 1945. Following graduation, Jackie worked for Jim White in White’s City, where she met a fine-looking man, John C. Allison, fresh out of the Navy and with whom she was quite smitten. They soon married on Oct. 4, 1948, in Carlsbad. Jackie and John were married for 53 years and wonderfully blessed with three loving daughters: Linda Nowak of Roswell, Janet Bean and husband Mickey of Artesia, and Shirley Maxwell and husband Scott of Carlsbad. Jackie, along with her husband and three daughters, settled in Artesia in 1964, where she eventually retired from Safeway Grocery Store in 1988. She was a member of the United Food Commercial Workers Union, Hermosa Drive Baptist Church, and the Artesia Senior Center. Jackie did not have any hobbies such as sewing, gardening or painting, but she was a wonderful cook. She loved God and her relationship with him; she spoke of Jesus daily and would invite you to sing praises with her. Jackie loved her family and enjoyed visiting and spending time with them. She enjoyed dancing at the Senior Center and travelling to places such as Branson, Mo., cruises to the Caribbean, the mountains, and many other places. After John’s passing in 2001, Jackie met McKinley Nance at the Senior Center, and the two were married July 5, 2003, in Artesia. McKinley predeceased her Aug. 26, 2014. Those left to cherish the memories of Jackie, along with her three daughters, are loving grandchildren Eddie Nowak of Hope, Tony Nowak and wife Blanda of Hagerman, Stacy Stapleton of Roswell, Abby Archer and husband Donald, and John Bean, both of Artesia, and Scott Maxwell and Sheldon Maxwell, both of Carlsbad; 20 great-grandchildren; five great-great-grandchildren; numerous nieces and nephews; and a host of friends, who all dearly loved Jackie for her beautiful smile, loving conversation, and sincere hugs to all. She was also preceded in death by her parents; five sisters; six brothers; son-in-law Carroll Nowak; and great-great-grandchild Alannah Stapleton. Jackie loved her family unconditionally and always was content to stand in the shadows with that beautiful smile and let us all shine. She never failed to say a prayer if one was in need and always said “love you” with a kiss on the cheek. We love you, mother, beyond any words written. In lieu of flowers, the family requests memorial contributions be made to the New Mexico Christian Children’s Home, 2200 S. Avenue I, Portales, N.M., 88130; or Lake View Christian Hospice, 1300 N. Canal St., Carlsbad, N.M., 88220. Many thanks to Dr. Salgado, J&J Home Care, Lake View Christian Hospice, caregivers Kristina Bean and Johnnie Sturgeon, and many friends who were always giving freely of their time, love and prayers. This obituary was lovingly written by her daughters.